Treadmills are considered by many people to be the best home exercise machine and they are probably right. From the comfort of your own home they allow you to take steps towards a fitter and healthier you. The problem with buying one is that there are many brands and models to choose from. In our ultimate guide to the choosing the best treadmill Australia has too offer, we will be showcasing the best models in our review section. 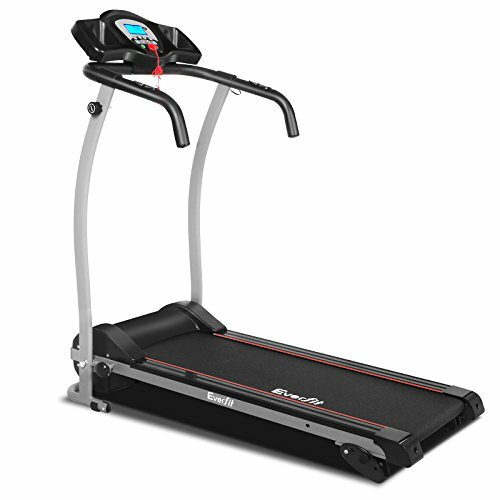 In addition our buyers guide has all the information you need to know for when deciding what is the best treadmill for your needs. Before buying a home treadmill there are a lot of things to think about first. 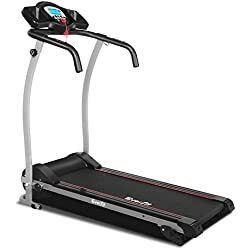 Rushing into a purchasing decision will more than likely lead to buying a treadmill that isn’t best suited to your needs. Knowing the following information will without doubt help you when choosing your treadmill of choice. 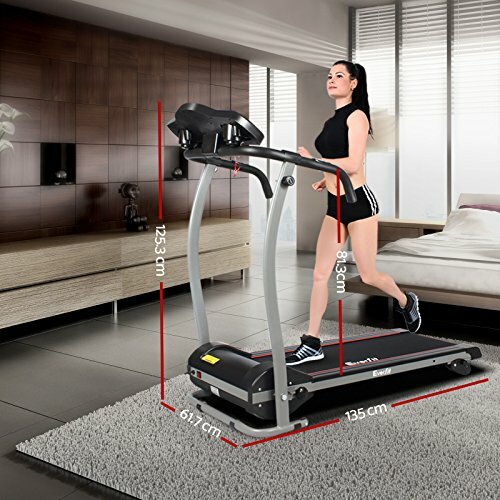 The running area of a treadmill plays a big part in overall comfort. A running area that is too small for the user leads to them having to constantly adjust their stride which is terribly annoying. 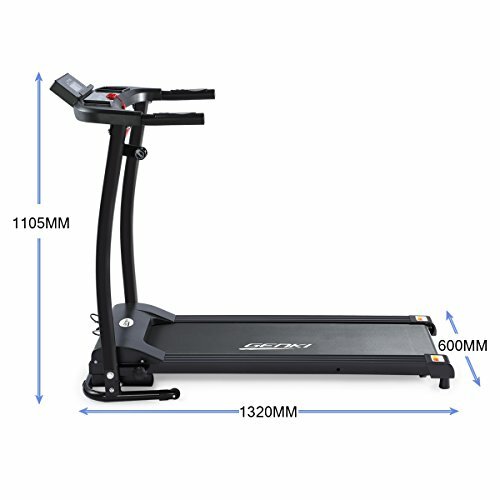 When buying a running machine a good running area is anything above 120cm in length and 40cm in width. Generally speaking the more expensive the treadmill the larger the running area will be. The incline option that comes with some treadmills adds a greater intensity to a workout. With the simple push of a button the incline can be raised to simulate running uphill. This is a good feature for more experienced runners looking to test themselves. These days most treadmills are foldable. This feature is a great space saver and makes home treadmills far more convenient for those with limited space in their home gym. Monitor functions are a great way to keep track of workout data and any progress made. 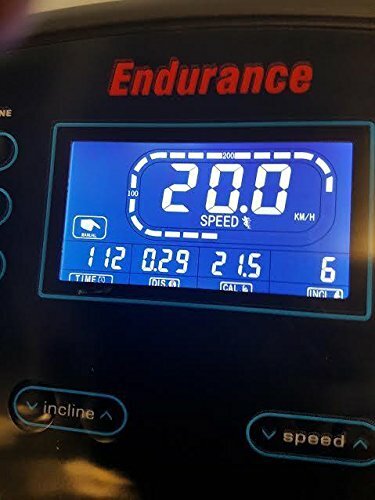 The best home treadmills come with a plethora of monitor functions that include any if not all of the following, speed, time, distance, calories, pulse. The more functions there are the better as they are a great motivation tool for reaching fitness goals. When buying a treadmill i would recommend buying one with as many monitor functions as possible. Exercise programmes offer variety to a treadmill workout and are a good feature to have. Generally speaking you won’t get any exercise programmes with a budget treadmill as they tend to be a feature associated with mid-price and top of the range models. Exercise programmes can range from sprints, marathons, pulse training and a whole lot more. The maximum speed is a very important purchasing consideration when buying a running machine. Speeds can range from 1 km/h to 25km/h depending on the model. A good top speed is anything above 12 km/h as this can give an intermediate user a good workout. However, if you are a more experienced user or very fit and healthy then you should be looking at models with a top speed of 20km/h or more. Due to treadmills been quite expensive, especially the top of the range models, i would highly recommend checking the warranty before purchasing. 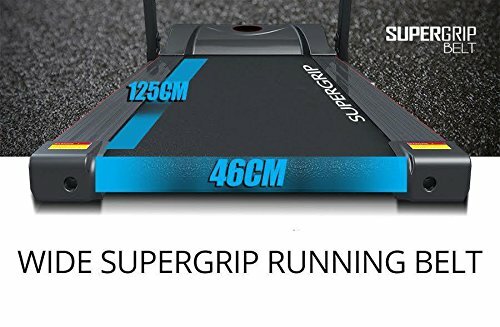 typically a budget treadmill will come with a warranty of only 12 months. The more expensive models come with extended an extended warrant with many brands offering a lifetime frame warrant and 5 years on parts and labour. The Sole F80 is a top of the range model made from high quality components and with capabilities that can be matched by only a few other models. 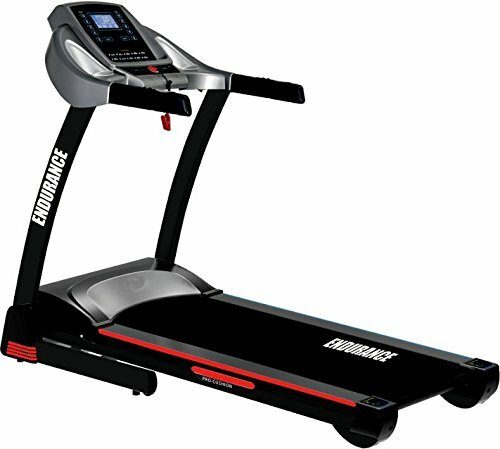 With excellent customer feedback from previous buyers it comes recommended as the best treadmill for home use. 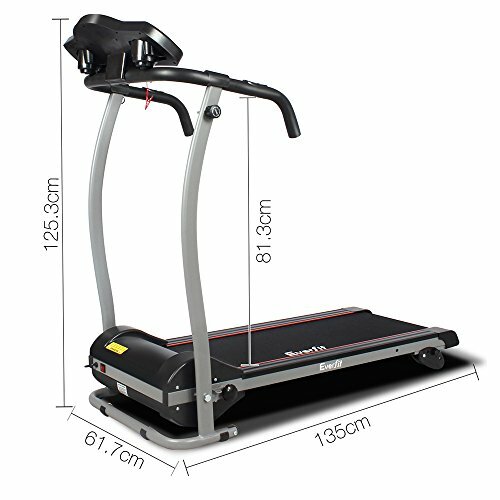 Like all of the best models for home use this is a folding treadmill and quite compact when not in use. It has a large running area which features a cushioning system that reduces impact forces on the joints by up to 40%. The Sole F80 comes with a large 7.5″ blue LCD display., from here users can track workout data. Monitor functions include time, pulse, calories, incline level, 1/4 mile track and RPM, more than enough to keep an eye on any progress made. In total there are 10 exercise programmes with 1 manual, 5 standard programmes which are fat burn, hill, cardio, strength and interval training. 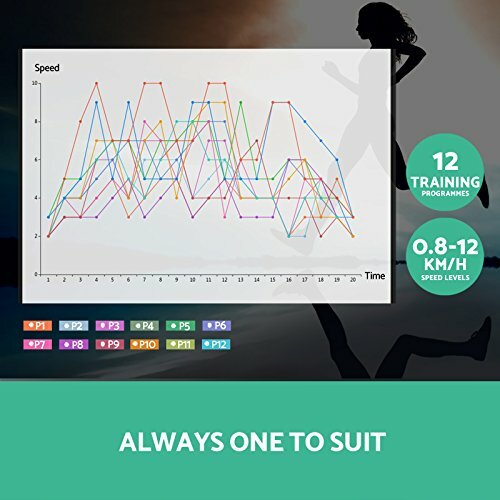 In addition there are 2 custom programmes and 2 heart rate. With a powerful 3.5 CPH motor there is a top speed of 19 km/h which is more than adequate for giving a good workout. In addition the 15% incline adds greatly to the workout intensity. Additional features include a cooling fan and an MP3 compatible sound system. 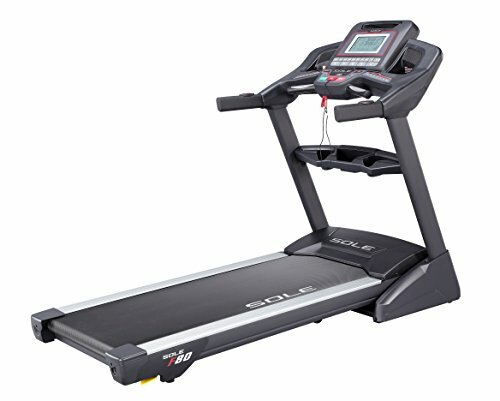 If you are looking to buy the best overall treadmill for home use then the Sole F80 is our number 1 choice. It comes with top of the range features and specifications at a price that offers great value for money. Due to the lifetime warranty on the frame, running deck and motor you can’t go wrong with this one. 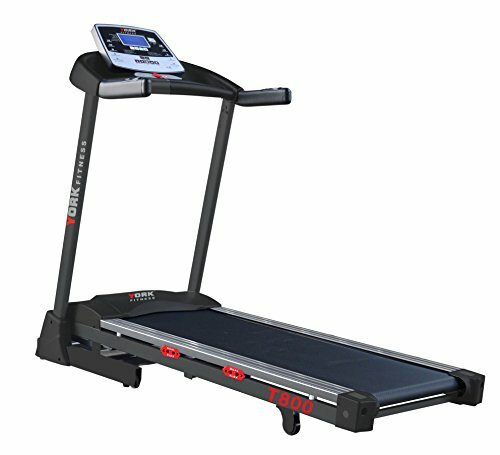 York Fitness are well-known for their high quality home exercise machines and the York T800 is one of their best-selling treadmills. For a reasonable price it has a lot to offer and its only half the price of the Sole F80. With a 2.5 HP continuous motor the T800 can reach a top speed of 16 km/h which is sufficient for all but the fittest of people. 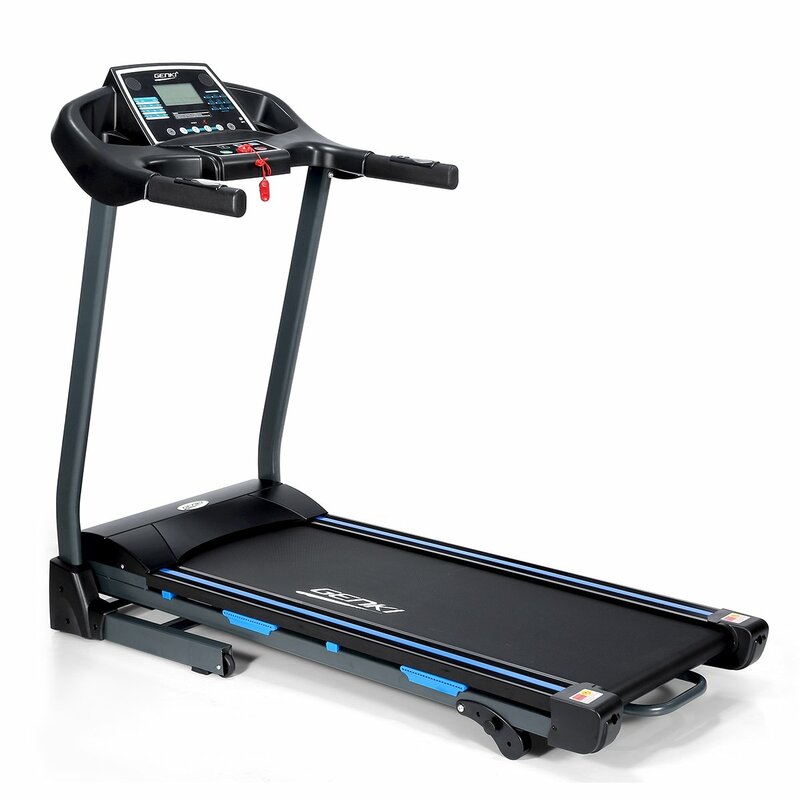 With 15 levels of incline there is an added dimension of intensity which is to be expected with a high-end treadmill. Featuring a large running deck of 142cm x 46cm this model is recommended for users up to a height of 6ft 4″. When not in use the running deck can be easily folded and it only takes a moment to do. In terms of exercise options the York T800 performs above average with a total of 20 exercise programmes. These include 1 manual, 12 pre-set programmes, 1 body fat, 3 target and 3 user programmes. As you can see there is a lot of variety to be had with this running machine and plenty to keep you entertained. The MP3 capabilities for playing your favourite music are a great motivator and the built-in speaker is of reasonable quality. With a maximum user weight of 120Kg this is not as sturdy as some other models, however, it is still adequate for most people. If you are looking for value for money then the York T800 comes highly recommended. 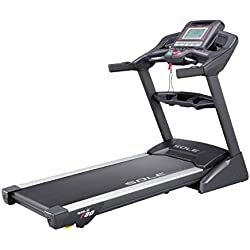 For half the price of a top of the range model buyers can get themselves a treadmill made by a very reputable brand and with almost the same features and specifications. Overall this is one of the best mid-priced treadmills available in Australia today. 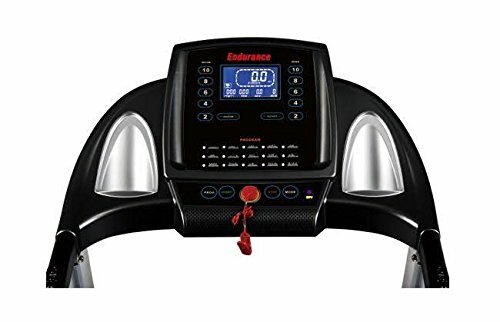 Offering a good mix of quality and affordability the Endurance SPT has quickly become the best-selling treadmill on Amazon. With excellent customer feedback and a 5 star rating this treadmill comes recommended as our top pick. 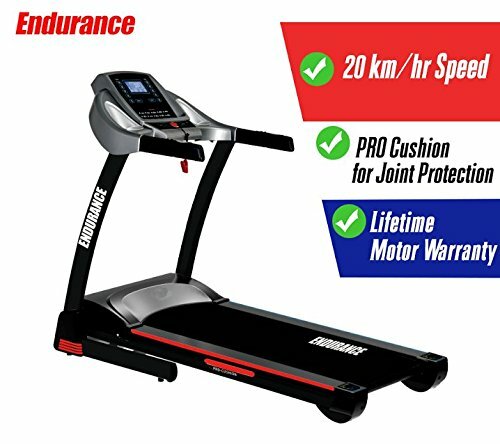 With a top speed of 20km/h it is easy to why the Endurance SPT is popular with both beginners and experienced users of treadmills. The 2.5HP motor ensures this treadmill is perfect for walking, jogging or running. For comfort the 8 point cushioning system built-in to the running deck helps to reduce the impact on the joints. It is also worth mentioning that this is a feature normally found with more expensive models. Additional features include MP3 compatibility a water bottle holder, transport wheels and a tablet holder. The Endurance SPT provides unbeatable value for money, making it a very good buy for those looking for a great deal. With many features and specifications normally associated with far more expensive models it comes recommended as the best value treadmill. In addition with a maximum user weight of 160 Kg it is undoubtedly very well made and built to last. 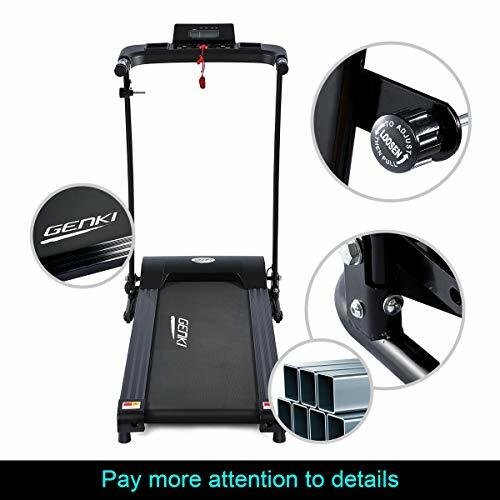 The Genki brand have built a solid reputation for high quality exercise equipment at an affordable price. 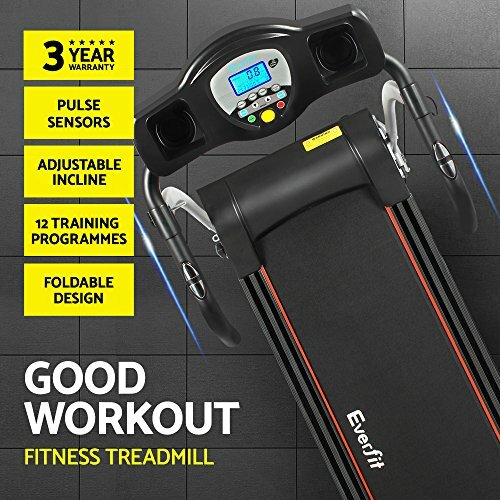 Many of their products are best-sellers on Amazon and the Genki 2HP Treadmill has already earned a good number of very positive customer reviews. For a budget treadmill the Genki punches well above its weight in terms of features and specifications. First of all it has a top speed of 15km/h and is powered by a surprisingly quiet motor. 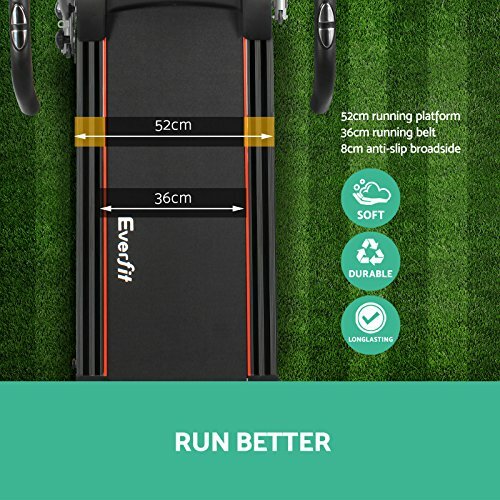 The running area is a good size at 120cm x 42cm and it has a built-in cushioning system which is rare for a budget model. 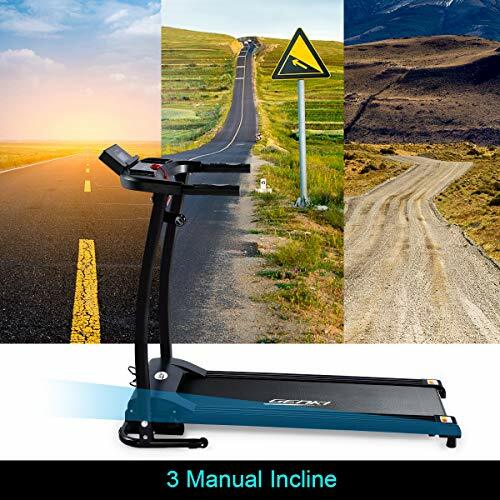 There are also 3 incline options these are road, aeroboc and climbing mode. With 9 pre-set exercise programmes there are plenty of options for alleviating boredom while exercising. For keeping track of a workout the LCVD display gives the following readouts speed, time, distance, calories, pulse. 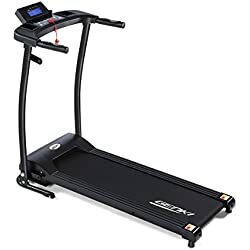 With this being a budget treadmill many would expect it to be quite flimsy, however, that is not the case, with a heavy tubular steel design it is very sturdy when in use. In addition it also has a good maximum user weight of 130 Kg. Additional features include MP3 connectivity, built-in speaker, Ipad stand and a bottle holder. The Genki 2HP Treadmill is affordability at its very best. 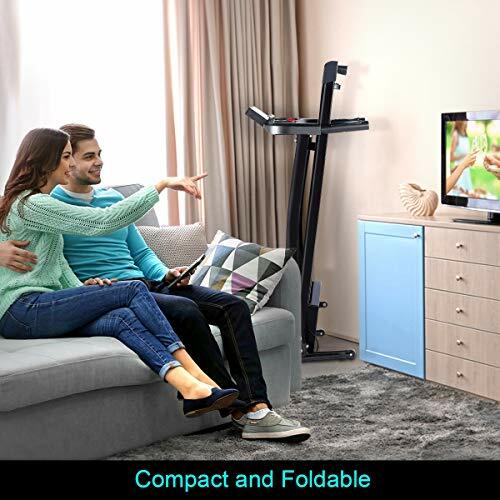 Unbelievably this running machine has a built-in cushioning system, incline option, 5 monitor functions including pulse and BMI measurements, 9 exercise programmes and all at an unbeatable price. 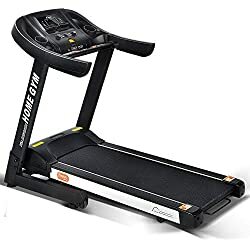 If you are not wanting to spend too much on a treadmill, i would recommend buying this model as you won’t get more for your money anywhere else. 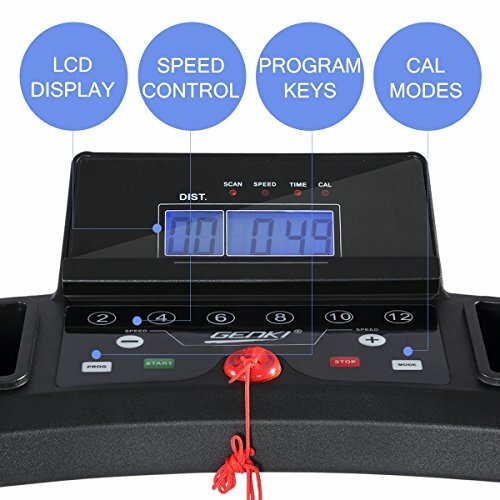 1HP Powerdrive Motor not only provide continuous power, meeting your daily exercise need, but also bringing you quiet workout experience, would not disturb you enjoy you music while running. Durable Sturdy Frame and Quality Welding Technology bring better support and would not wobble to prevent spraining, effectively minimize the vibration to reduct the impact on knee. Delicate Baking Varnish make it brighter and smooth, increase the capacity of antioxidant. 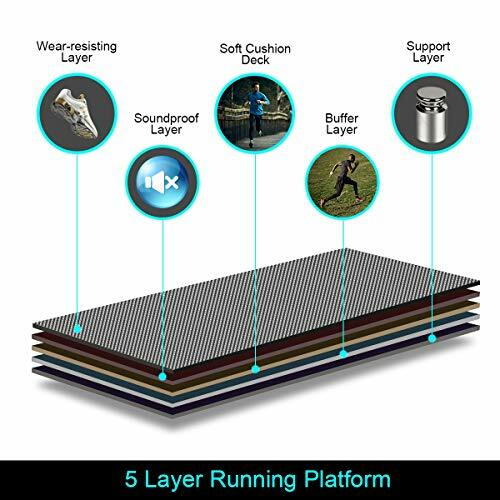 High Intensity Composite Running Belt, Effectively antislip and increase wear-resisting and silence. 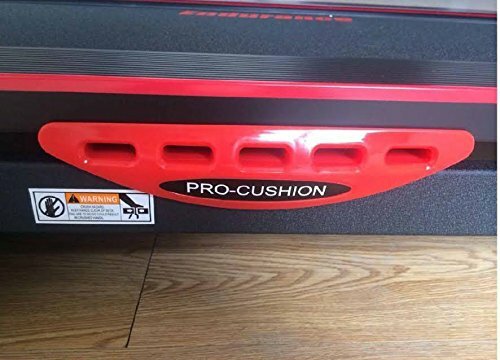 Eliminate cushion between the running board and the contact surface to protect the knee. Space Saving Design: it's compact and ideal for any one of your rooms, foldable to be stored near the shelf or under the bed. Antiskid wheels make it easy to transport. Easy to assemble with tools and manual. 12 programs: increase the intensity by changing the angle, bringing you better training effect. A Year Warranty. If you are on a limited budget there are plenty of models to choose from, unfortunately only a handful are worth considering. 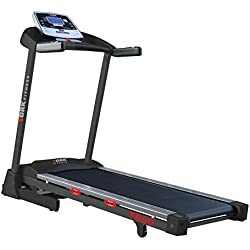 One of the best cheap models is the Everfit Electric Treadmill. With a 5 star rating on Amazon and some good feedback from previous buyers we recommend it as the best cheap option. Features include a top speed of 12km/h, a very respectable 12 exercise programmes and there is also an incline. The LCD is simple to operate and it only takes a couple of minutes to learn how to use all the different functions. The overall design is compact and the folding capability makes it perfect for home use. With a maximum user weight of 120Kg it is sturdy enough for most people. Additional features include 2 bottle holders and transport wheels for portability. 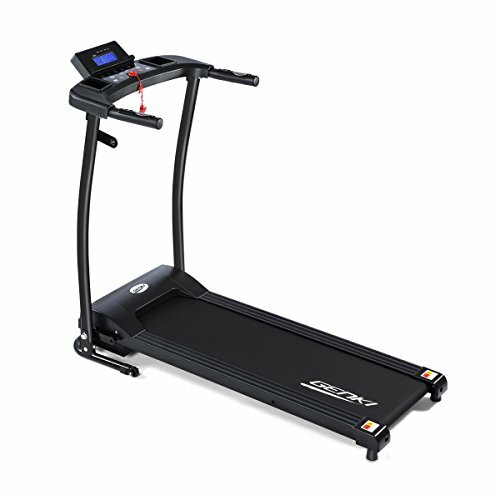 In addition the Everfit Treadmill includes a lifetime warranty on the frame and motor. With a limited budget it can be hard to buy a treadmill with any real quality too it. 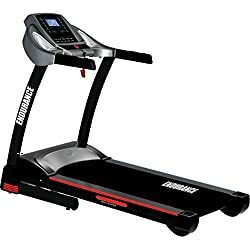 The Everfit Electric Treadmill is the best cheap option due to its above average features and specifications for a treadmill in this price bracket. The only bad thing to say about it is that the running area isn’t the biggest. 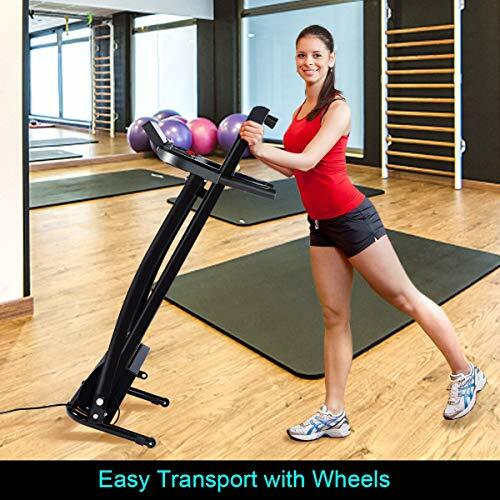 Space saving design, this treadmill can be fold up for easy storage and extremely portable with its smooth wheels. Dual drink holders are convenient for your bottle to place. Extra thick tube made with powder coated steel provides a strong support for your better running. 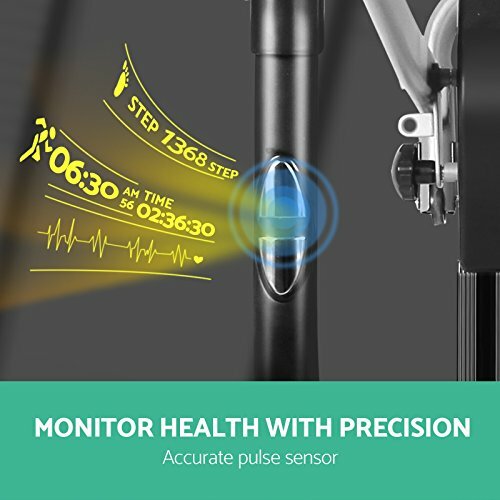 Anti-slip belt and soft-grip handle bar with pulse sensor will make your session a comfortable and controlled experience through and through. 12 built-in training programs with 12 speed levels and 3 adjustable inclination level for you choice via the user-centric control panel with bright digital LCD display. A safety tether key is designed for the emergency. 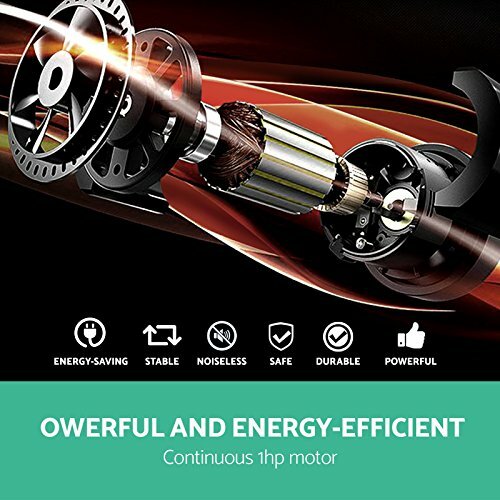 Work so quietly with super efficient motor that your less-than-enthusiastic fitness neighbours will not even know you’re sweating it out at midnight. Lifetime warranty on frame and motor. Max. User weight of 265 lbs. Buying a treadmill doesn’t have to be a big headache, especially if you know what you are looking for. In our buyers guide we have included all the information needed for choosing the best treadmill. Furthermore the models included in our review section should save you time and effort when trying to get the best value for your money. After hours of research into all the different brands and models available we have compiled all the top treadmills at varied prices with the best quality/price ratio. If you think we have missed a model out that is worthy of a place in our top list please comment below. 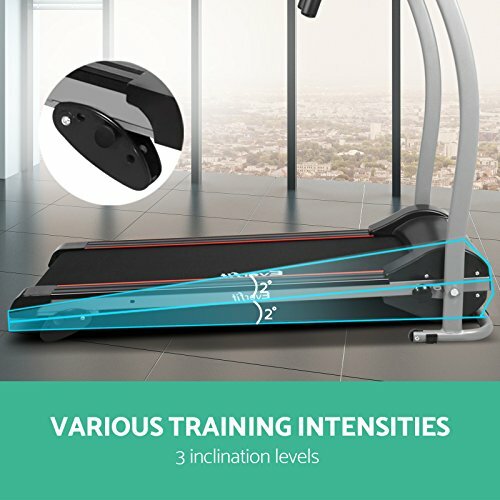 More exercise machines you maybe interested in.